The big focus tomorrow is on ECB President Trichet’s press conference. The European Central Bank is not expected to raise interest rates, but Trichet IS expected to pave the for a rate hike in July. 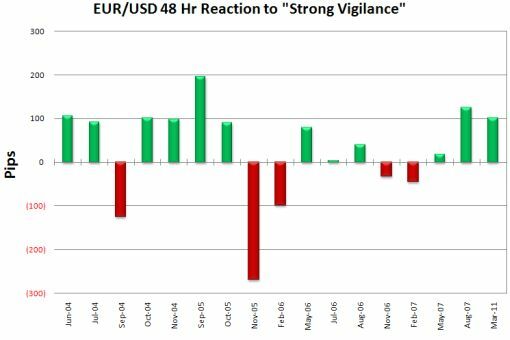 Over the past few years, the words “Strong Vigilance” have been synonymous with “interest rates will be increased next month.” Regardless of whether this has been priced in or not, it seems that euro traders almost always respond positively to the words strong vigilance. 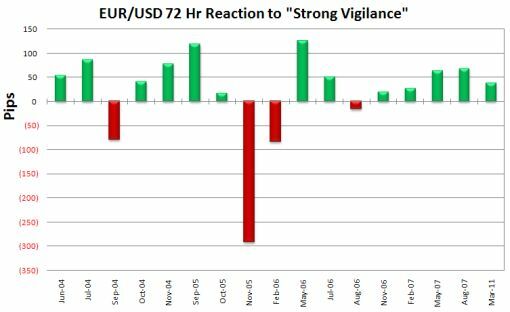 The following charts show how the EUR/USD reacted in the days that followed central bank meetings where the words “strong vigilance were used.” Since Trichet took the role of European Central Bank President, he has used these two magic words 17 times. On the day that these words were used, the reaction in the EUR/USD can be choppy -- the currency pair ended the day in positive territory only 64% of the time, or on 11 occasions. However from the day of the rate announcement to 48 hours later, the EUR/USD appreciated 70% of the time or on 12 occasions. The strongest pattern is seen on a 72 hour basis. 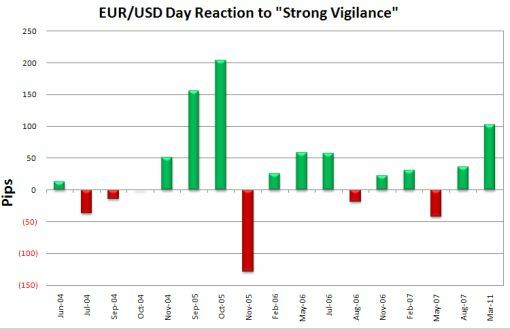 History shows that when the words strong vigilance are uttered by Trichet, the EUR/USD appreciated 76% of the time. This suggests that even though the EUR/USD pulled back today, if Trichet says “strong vigilance” is needed on inflation, expect the EUR/USD to resume its rise. ← What Now for the AUD?